Note: To those familiar with it, these thoughts are taken from Lecture Five. They are not original with me, but I have tried to summarize them in my own words as I have studied them. Sharing my notes is the way I customarily study doctrine. You will note many of the concepts here do not coincide with current teachings of the LDS Church, but they are all based on scripture. I always welcome dialog and discussion, especially from those who offer studied but opposing views. “All priesthood is Melchizedek, but there are different portions or degrees of it. That portion that brought Moses to speak with God face-to-face was taken away, but that which brought the ministry of angels remained. All prophets have the Melchizedek priesthood and were ordained by God himself.” (TPJS 180-181) This is as true today as the day Joseph taught it. According to D&C 84:42, the higher priesthood is conferred by the voice of God to men out of the heavens. Joseph is not talking about offices in the LDS Church. Priesthood existed long before the LDS Church was organized. The LDS Church is dependent upon priesthood for authority and power. Apostle, Seventy, High Priest, Elder, Priest, Teacher, Deacon are offices in the Church. They aren’t priesthood at all. They occupy positions in the Church of various church offices, with or without the presence of priesthood. This is not so radical if you think about our LDS history. When John the Baptist appeared and conferred the Aaronic priesthood upon Joseph and Oliver, he had them baptize and then ordain each other. This was in May 1829, long before the church was organized. It is interesting to note the Holy Ghost fell upon Joseph and Oliver in great power immediately after being baptized. They were both filled with the spirit of prophecy. In addition, their minds were enlightened so as to understand the meaning and intention of the scriptures. Faith and priesthood are two different things. People can heal by faith without priesthood. Men can do marvelous things through faith in Jesus Christ without being ordained to the priesthood. This is evidenced in scripture by young Melchizedek who “was a man of faith, who wrought righteousness; and when a child he feared God, and stopped the mouths of lions, and quenched the violence of fire.” (JST Gen 14:26) His ordination occurred after he had exhibited great faith. A man does not lose the priesthood when he is no longer a member of the LDS Church. Even the Handbook verifies this on page 122 under Restoration of Blessings. Under the direction of the First Presidency, an Area Seventy usually performs the ordinance of “restoration of blessings.” He does NOT ordain the man to the priesthood again, nor is he required to be endowed again. What does that tell you? A man does NOT lose his priesthood when he resigns from the church. In other words, the LDS Church does not and cannot control priesthood. It is controlled by God. This is contrary to letters sent out by local church leaders stating that priesthood is withdrawn. Sorry. That’s false doctrine. I don’t know how many different ways I can express this to make the point clear. I received the Aaronic priesthood from my father. I still have it, along with a line of authority to prove it. The higher Melchizedek priesthood is only received directly from God. Priesthood is not a franchise. It is not something that is given in order to control others. In its highest form, Priesthood is an opportunity, afforded you by God, to serve and to bless others. It its highest form, the Priesthood is a call to save and a call to redeem. It is a call to rescue others from destruction. The lesser priesthood is often used to condemn. In fact, when condemnation is placed upon a man in the church, you can be certain it is not performed with higher priesthood. The real definition of Priesthood is an association between mankind and those on the other side of the veil. It is a brotherhood, and, potentially, a sisterhood. It is a fellowship, a ministry. It is a connection between the Powers of Heaven and the man or woman. Its purpose is raise up and to bless, never to condemn. In fact, if a fellowship or priesthood is used to condemn it may as well be considered as one of Satan’s priesthoods, because such condemnation does not save souls. Priesthood is not a hierarchy, at least not the kind that mortals like to employ in which they love to control and compel others. Priesthood is more like developmental stages on Jacob’s ladder. Each stage of association, fellowship or priesthood is moving toward perfection. To be higher in your perfection is to be near to and therefore more like God. The only tools of the priesthood are persuasion, love, meekness and pure knowledge. It is never used to control or compel others. Joseph named some of the powers of heaven for us: angels, archangels, principalities, powers, dominions, thrones, cherubim and seraphim. These are all powers of heaven. D&C 121 teaches us how we are to relate to these powers of heaven. If you offer knowledge using persuasion, gentleness and love unfeigned, you are going to find someone who is armed with the power of heaven and who has an association with the powers of heaven as named by Joseph Smith. Priesthood power comes by sharing truth, light and knowledge from a higher source. When one uses priesthood he does not teach the philosophies of men mingled with scripture. He will teach new truth and therefore shed new light on subjects, because such teachers are filled with light and truth themselves. They have authority given them to make men more like God, to lift and to elevate them, to enlighten and strengthen, to encourage and to point the way toward the Savior. It will be knowledge that exalts you in the afterlife. We progress and grow, line by line, step by step, rung by rung, until we arrive at the station of an exalted and glorified being, dwelling in everlasting burnings. The afterlife does not consist of only a heaven and a hell. The afterlife is not a destination, and is not limited by time. Remember, it will be a great time after we have crossed through the veil before we will have learned all there is to be learned for exaltation. There are two different fellowships in the priesthood. One is between men or women and the other is between men and God. The fellowship we have on earth between us is different from the fellowship we have with heaven and the powers of heaven. Enoch taught us in Moses 7:27 it is the powers of heaven who bring us up into Zion. Think about that. While we are attempting to prepare for Zion among ourselves, we must also seek to have fellowship with Zion above us. There are many examples of these two fellowships in the scriptures: Enoch, Moses, Abraham, Jacob and others. They were first ordained to the fellowship among their brethren. They then went and obtained their errand from the Lord and established their fellowship with the powers of heaven. We ought never to be content to simply have the association that exists here. We should always seek to know and associate with the powers of heaven as we prepare for Zion to come. Don’t let anyone deceive you into believing this association is only meant for the afterlife. The purpose of the priesthood is to be able to see the face of God and live. It is to allow the power of Godliness to be manifest unto men, in the flesh. (D&C 84:21, 76:118, 93:1) This power, this priesthood, this fellowship, this association with the powers of heaven was meant to be laid hold upon by mortal men while here in this life. This life is the time to take care of this assignment. When Joseph said there were different portions or degrees of priesthood he meant the different fellowships and different associations we can have with the powers of heaven that exist on the other side of the veil. We need to cultivate that association in this life. Our growth requires these fellowships or priesthoods in order to obtain the power of Godliness so we can attain to the resurrection of the dead and dwell in everlasting burnings. Thus we can keep our second estate. Even that priesthood conferred by the voice of God is perishable, if you are unwilling to restrain, and to contain yourself within the bounds the Lord has prescribed. Although Joseph did not, the church lost the higher priesthood, else why would the Lord point out the need to “restore again that which was lost unto you, or which he hath taken away, even the fullness of the priesthood?” (D&C 124:28) While we’re still mortal, it is possible any person can lose the higher priesthood. I’ve always wondered why angels would choose to be angels as opposed to becoming Gods. It is because they are unwilling to believe they can obtain such a blessing. They limited themselves. It is the same with us. We hedge up our own way to heaven when we fail to develop sufficient faith and confidence necessary to lay hold upon all the blessings offered, because we believe those blessings are reserved for others and not for us. Like the children of Israel, we damn ourselves. The Children of Israel would not ascend the mountain. They demanded a prophet to speak to God for them. They would not speak with God themselves. Thus they were cursed by God. Can you imagine how God must feel about those who preach today we are not entitled to receive any kind of revelation beyond what they say we can receive? Yes, there are those among us who say we cannot receive an audience with Christ, because such things are reserved only for prophets. Joseph could not get the Saints to complete the Nauvoo temple before he was killed. Had they done so, the promised blessing in D&C 124:55 would have been fulfilled. The Lord wanted to restore the fullness of the priesthood – the higher priesthood – to the church. He had placed the church under condemnation in D&C 84:56. In D&C 124:28 the Lord told the Saints He had taken away the higher priesthood. The Temple was required in order to restore what was lost. If there’s one thing I have noticed as a result of being baptized again, it is the way I can now clearly see the meaning of the scriptures. Not only has my desire to study them increased, but the spirit bears witness to me the interpretations the LDS Church has taught for years about some passages, particularly in section 124, are simply wrong. We have lost the plain meaning of what the Lord tried to tell us there, or else we are just too blind to see it or are unwilling to accept it. Joseph left us enough of the doctrine in the endowment ceremony, particularly in the method of approaching the Lord at the veil, for individuals to obtain the promised blessings for themselves. In other words, we can converse with the Lord through the veil. We can obtain an audience with the Savior. We can be sealed to the Fathers and eventually, come back into the Father’s presence. This is the promise of the holy priesthood. It can be obtained in this life if we desire and seek it. One thing I didn’t point out in the post, but want to make clear up front: In order to understand this post and lecture five, we need to rethink and even redefine what we think we know about the Melchizedek Priesthood. The main thesis of the post (and PtHG) is that the higher priesthood cannot be passed from man to man as can the Aaronic. I know of no other power nor authority stemming from priesthood than this. The faith and power spoken of is a prerequisite to obtaining the high priesthood, not the result. And there are Gods among us. I’m using the JST as the base, but even the JST doesn’t render this consistently. 1 The Gods stand in the congregation of God; he judgeth among the Gods. 2 How long will ye suffer them to judge unjustly, and countenance the wicked? Selah. 3 Defend the poor and fatherless; do justice to the afflicted and needy. 4 Deliver the poor and needy; deliver them out of the hand of the wicked. 5 They know not, neither will they understand; they walk on in darkness; all the foundations of the earth are shaken. 7 Surely ye shall die like Adam, and fall like a prince. 8 Arise, Gods, judge the earth; for ye shall inherit all nations. The divine council is an interesting topic to pursue. It’s odd to me, because if there is any controversial teaching to Mormonism per se, it’s this, but it’s straight out of Psalm 82. From Psalm 82, it appears the members of the divine council come down among us and live as men as part of a rescue operation. Indeed, a frequent charge against the people of God has been henotheism / polytheism. 25 Jesus answered them, I told you, and ye believed not; the works that I do in my Father’s name, they bear witness of me. 39 Therefore they sought again to take him; but he escaped out of their hand. Anyways, see Abraham 3-5, and I think this article is a good one to read. It is also at odds with the Lectures on Faith 5.2, “the Father being a personage of spirit, glory, and power, possessing all perfection and fullness”. God is not a polygamist and there will be no polygamy in the next life. D&C 121:42 shows that priests must operate by pure knowledge. If a man tells me what to believe, or (more particularly) what to disbelieve, of heavenly things, then I hope he can answer this straightforwardly: has he gazed into heaven? If not, why should I hear him? And if he answers “yes,” he is inviting further testing from me. I read your breakdown of section 132. Best ripping apart of that section I have seen. Well done. Amen to no polygamy. Your conclusion is then that Joseph was a fallen prophet having practiced polygamy. You also equate polygamy to “The New and Everlasting Covenant.” That is not a conclusion that I reach. The New and Everlasting Covenant is described as a man and a wife — singular. Polygamy was something altogether different. A just judge withholds judgement until the truth is made known. If it is merely possible the accused can be innocent, a just judge finds in favor of the accused. Sincere question here: are you suggesting Joseph Smith didn’t practice polygamy? Or are you suggesting that Joseph’s practice of polygamy was sanctioned by God? I was complimenting you on your willingness to withhold judgement while suggesting you were presenting a model to follow. I do not know, neither do I care, whether Joseph was or wasn’t practicing polygamy. I cannot understand why other people care. I’ve been racking my brains and the only thing I can come up with is that those who have issues with what other people do or don’t do in matters marital probably have had a spouse who has committed adutlery and are reacting against that. That’s just a speculation on my part. Ah! Haha, it is a bit difficult to read tone and intent. Thank you for clarification. I honestly couldn’t care less either. It doesn’t bother me. The widespread practice bothers me because I don’t believe God wanted the Saints to practice it on that scale. Always appreciate your comments. Keep them coming. The “new and everlasting covenant” originally applied to baptism until it was changed to mean eternal/celestial/plural marriage in 132. In 132 those ‘marriages’ are completely intertwined. There is no clear delineation between the two in this section and a lot of it is left to guesswork on what it really means. And both are brand new doctrine never mentioned in any other scripture. None of us are perfect and we all sin, even prophets. I believe JS practiced it, later regretted it and tried to repent of it. What evidence do you have of Joseph’s attempt to repent of it? Thanks for posting this quote LOG. I have been thinking about this one a lot lately and I am trying to decide if it is false. I know a lot of people who seem to believe too much and act on too much. Like polygamy, or any number of various doctrines that if believed and practiced, will actually lead to damnation. I think Joseph may have misspoke here. Perhaps when he said believe he meant to gain a spiritual witness of it. Certainly we shouldn’t follow anything unless we have a confirmation from the Holy Ghost first. I do realize these are just a few thoughts on priesthood, but for a closer analysis of the history and development of the concept of “priesthood”, I would like to share this chapter from “Power from on High” by Gregory A. Prince. Notice in alma 13 it says he took this priesthood upon himself. There is a “holy ordinance” and a “holy calling”. This has nothing to do with men laying their hands on you. Notice the title of “Prince of Peace” given to Melchizedek. These are titles that have also been given to Jesus. I believe Paul in Hebrews is teaching through a lot of veiled symbolism how one can go about obtaining the high priesthood. Also Samuel when he heard the voice of God calling him by name. It must start with us hearing the voice of The Lord. To become a great high priest we must ask ourselves a question that Jesus asked James and John… Are we willing to drink the bitter cup that Jesus drank of? Are we willing to be baptized with the baptism that he experienced? There is so much more to taking upon us the name of Christ and being willing to mourn with those that mourn and comfort those who stand in need of comfort. Jesus told us to let our light shine, and the light which we are to hold up is Christ! We must become vessels for the Holy Oil to work through, giving all glory to God. Great great post Tim. I hope people who have not considered that the church does not have the authority to bestow the high priesthood might pray about it. If Melchizedek Priesthood is necessary in order to see the Lord, and no one in the church really possesses it (after Joseph Smith) then how did Denver Snuffer obtain this blessing? I think your belief that we only have Aaronic Priesthood in the church today is an absurd contradiction, and would invalidate Snuffer’s claims, and would make your search to pierce the veil vain if true. Tim, how do you reconcile this contradiction? Why is there only a contradiction, in your view, with respect to the LDS Church, and not a contradiction with respect to the ancient Jewish church? The way I see it, if there is a true contradiction, it would hold for both or neither. Just judges do not employ double standards. Sorry, Log, I don’t understand your question. Please clarify and then I will try to address. Best. In ancient Judea, prophets were raised up unto the people from outside the priestly hierarchy, which solely possessed an inherited Aaronic priesthood. As Joseph stated, these prophets were ordained to the Melchizedek priesthood by God himself. Therefore, the hypothesis that the Church only possesses the Aaronic priesthood does not preclude Snuffer from having obtained the Melchizedek priesthood, as he could very well have obtained it in the same way the ancient prophets did. Therefore, I don’t understand wherein you see a contradiction, or, if there is a contradiction, it seems to me to hold with equal force against the ancient Jewish Church. Log, I would say that it is my opinion that we are only bound by the rules of this dispensation, or if there ever appears to be a contradiction that we would accept the procedures for our current dispensation over a past one. In this specific, to my interpretation of D&C 84, verse 14 states that Abraham received his greater priesthood blessings from Melchizedek, which would infer a man to man ordination. So, in this case you have an example of the passing of higher priesthood by ordination seemingly in conflict with Joseph’s statement that all the patriarchs received these blessings directly under the hand of God. From verse 24-6 it seems clear that Israel was left with the lesser priesthood, which clearly doe not include the greater spiritual blessings outlined in verses 19-22. Verse 22 is emphatic: For without this (apparently either the ordinances and/or authority of the higher priesthood) “no man can see the face of God, even the Father, and live.” In my opinion, it is possible to resolve the dilemma by accepting the possibility of 3 levels of priesthood, the 3rd having been pulled back in the time of Joseph, and first 2 operative now, and the 3rd only becomes “real” when it is obtained from God or a true heavenly messenger, and that this would result in the “fullness” of the priesthood being received by the individual, along with the other higher spiritual blessings being received. I am not dogmatic about my present understanding however, as I may have it wrong. But looking at priesthood as somehow being on a continuum with 3 levels seems to make sense to me at least of the Morley Farm incident, the failure of the Saints to finish the Nauvoo temple (that they lost this 3rd tier) and that real higher priesthood remained with the Saints, but not the fullness. Since the doctrine of C&E was pulled back, since it dissapeared after McConkie and Romney taught it in conference in the late 1970’s, it seems that current leadership is not even aware of the possibility of there being more priesthood than is currently being dispensed. Anyways, best regards. Karl: Great question. Well asked. I agree the higher priesthood is necessary to behold the face of God and live. I do NOT agree nobody in the LDS Church really possesses it. I am confident there are many – I personally know several – who have seen the face of the Lord. The scriptures provide ample evidence of men who received an ordination and then, years later, received their errand from the Lord. I thought the example of Jacob, Nephi’s brother was one of the most obvious, which is why I used that one in particular in the post. I have two questions for you: 1) How did Joseph see the Father and the Son in the First Vision unless he had the higher priesthood? Did Joseph bring the higher priesthood with him? (D&C 84:22). 2) What is to prevent a man from receiving the higher priesthood direct from God? Well, I don’t really see a problem with the Father & Son appearing to Joseph Smith, before he has any priesthood at all. In other words, I think D&C 84:22 applies to those in the church, that they must have Melchizedek Priesthood in order to receive any higher blessings from God, because that priesthood holds the key of these spiritual gifts. This is analagous to when John the Baptist gave authority to Joseph and Oliver, and then Joseph baptized Oliver, before He was baptized. Now that would normally be contrary to the order of things, for an unbaptized individual to baptize someone, but here the problem is unavoidable. I suppose John the Baptist could have done it himself, but since he didn’t (or possibly was not allowed to), something had to solve the problem. In the receipt of spiritual blessings I would suggest that when the real Melchizedek priesthood is on the earth (and I think it is), then in order for one to obtain spiritual blessings they must procede in a lawful manner, which means under legal authority of that priesthood. My opinion is that we do have both Aaronic and Melchizedek priesthood operative in the church, but we do not have a “Fulness” of the priesthood, in the sense of all the authority it is possible to have, until the Lord bestows it directly upon one. My understanding is that one’s level of actual Priesthood is on a continuum. Many in the church are deceived because they think that ordination alone does something for them; but inactivity in the priesthood not only is sterile, in fact it will damn many in the end, because they have not really magnified it. You ask: what is to prevent a man from receiving higher priesthood direct from God? Nothing, but one’s lack of belief. But, also, in my opinion, if you jump off the straight and narrow course and try to climb up a different way, you are going to have difficulty. If the church has legitimate authority, then one MUST come through the baptism administered by a legal adminstrator (Joseph Smith is emphatic on this point in TPJS) for the baptism to be recognized by heaven. My fear for you, and expressed by many of your friends I am sure, is that in your zeal you have jumped off the correct path. However, I think after a time you will realize the error, and ultimately get back. I say this in sincerity and wish you the best in your pursuit. I do not have any animosity or bad feelings to you or to Denver Snuffer; however, my conclusion after long and ponderous study and prayer is that his witness is FALSE, and that eventually this will become obvious. At that time, I am sure that those in the church will welcome you back with open arms, back into the body of Christ. All the best. All spiritual gifts come via the Holy Ghost and are independent of church membership, centralized mortal authority, etc. Both men and women may receive spiritual gifts. A discussion of the Melchizedek Priesthood is a very valid topic. But I would also like to see more acknowledgement of authority granted by the Holy Ghost, particularly in Church meeting discussions, lessons, etc. Yes, I mostly think of times when I did not follow the Holy Ghost, and it brought about some degree of grief or heartache. True, following the Holy Ghost would have put me in hot water with local church authorities, but it would not have been as great as the problems caused by not following the Holy Ghost. Part of the problem might be that I am too passive-aggresive. Good point about the Jews I had not thought of that but they have an unbroken line of authority. Perhaps even the Catholic Church, which gives the possibility of any Christian break off from the reformation to have the aaronic priesthood. I will have to think on this. I believe that Denver claimed that anyone can obtain the higher priesthood and perhaps people have but it did not come from the laying on of hands of men. If the aaronic priesthood is preparatory do we even need the aaronic priesthood at all? Couldn’t someone outside the church bypass the aaronic priesthood and obtain the high priesthood? Maybe it has happened before. If a woman can see Gods face, hasn’t she bypassed the Aaronic priesthood? “He got the authority to baptize by the Spirit. If you are going to use the priesthood to perform a baptism, no matter what the Church has told you, no matter what quorum leaders and respected others, including your own father perhaps, have taught you, before you do so, ask God to give you the authority. Get the “word” from Christ through the Spirit, just as Alma did. His example is in the scriptures to teach us the way. We have lost it, and need to reclaim it. If you get power to baptize, you get it from Him and you are not dependent on someone else. But get the power from Him. Power is required. It must come from Christ. The pattern must be followed. Good one Tim. The priesthood is available for the act intended. It is not a cloud that encompasses us all the time. It is the power of heaven and always stays as you have an intended act until it is finished. That I have and understanding of through witness. Thanks for expounding. Where is that found? Thanks. Thanks so much. I have a new copy of Lectures on Faith by a Robert Smith. It must be some kind of condensed version because Lecture Five only has 10 pages and it has no reference to the quote you have offered. I will have to go to Desert book or someplace else and find an copy that has not been shortened or altered. Thanks again for the reference. Kathryn: Sorry for not being clear. It’s not from the Lectures on Faith. I was referring to the lectures delivered by Denver Snuffer over the past year. The original post contained study notes from that lecture delivered in Orem. Duh… I should have known. Thanks… I will look up my copy and refer to the study notes. Thanks. I challenged Karl to apply the same analysis to the ancient Jews and explain why there was only a contradiction in his mind with respect to the modern Church and not the ancient Church. I will, however, suggest the answer as to how one obtains the high priesthood – pray to understand the meaning of the endowment ceremony. Something to ponder. David Whitmer has a valid point. It is very important to understand the High Priest situation. It is true that nowhere in the New Testament does it mention High Priest other than Christ who indeed is the last great High Priest (Hebrews). Niether is it mentioned in the Book of Mormon after Christ returned. Since the High Priesthood was extracted from the saints, the High Priest office is moot. But the consideration of the necessity of a High Priest in the Higher Priesthood after the death and resurrection of Jesus Christ is to be considered. It is unclear that what happened at the Morley Farm was succinct for our understanding. We just don’t know. Just because it existed with the fathers prior to Christ, does not mean it is necessary after Christ. Sidney Rigdon did call for its implementation. I believe it is relevant for us today to get the understanding of the eternal aspect of the priesthood, how it relates to faith and how it has always been a part of men and women if we only recognize its power for use in serving others. Our Father will make it known unto us. This is a great thought. Thank you. 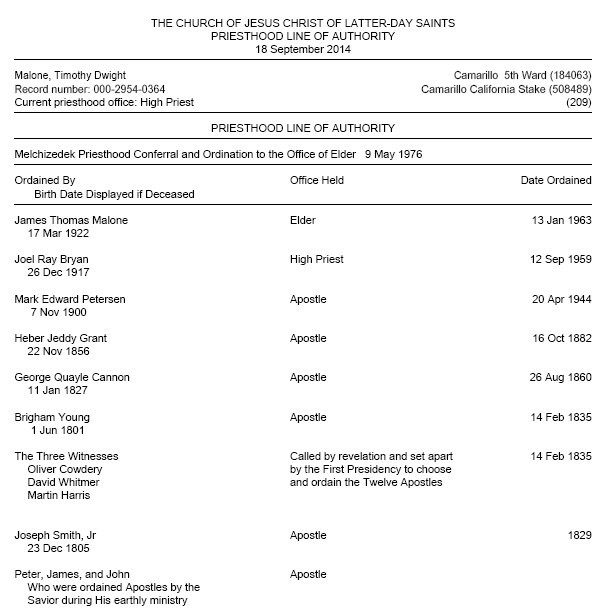 What david whitmer also points out is that people were being ordained as elders in the aaronic priesthood. Before the church was officially organized on April 6th. They had ordained many men as elders and spiritual gifts were given in great abundance. This begs the question if anyone really ever obtained the Melchizedek priesthood at all. And if so, to what office? In Hebrews when Paul speaks of Jesus being the great high priest of the Melchizedek priesthood, he almost alludes to Him being the LAST high priest of the Melchizedek priesthood. My personal belief though is that Paul was preaching that because of Christ we all can become high priests and he opened the door for there to be more than one that could enter the holy of holies from year to year. I do not believe a man has been ordained as a high priest in the Melchizedek priesthood since perhaps even the time of Christ. That being said, if revelations is prophecying of 144000 “high priests” of the Melchizedek priesthood, I can only imagine the power and miracles that will be poured upon those alive to see it. It would be like 144000 Enoch’s walking around. Believe all things, hope all things. The mind should never shut out what we don’t know because it doesn’t align with our belief system as structured since we have been young. It doen’t mean we become gullible, but I have had things revealed that would make others cry blasphemy. There is so much more out there in the real sense. We need an alignment check. The heavens are opening up and this is just the beginning. No more are we to think we “know” when we don’t. We worship God according to the dictates of our own conscience. That means his attributes and perfections are static, but how we are revealed about him may constitute differences to each of our minds. There also is new scripture coming forth that puts beauty of worlds without end and lives without end right at our fingertips. I have witnessed this. Be happy and enjoy the journey. The best is yet to come. What we think we knew will change. God bless. Amen and amen. You and I hold many of the same beliefs. Trust me what you know I would not consider blasphemous. Just because Jesus was the “last high priest” does not mean that all of the others who became high priests before will not return to the earth. It is the how of their coming that will blow many away. God speed and May He suddenly come to His temple! Someday I may just bear my full testimony on this blog but it would only bring mockery for now. I would like to hear that full testimony. No mockery here. Soon enough the world will hear many of our testimonies. I have a weakness of being over zealous and impulsive. I would no doubt be preaching to the choir. How wonderful that the earth will soon be flooded with the knowledge of The Lord and all will be corrected wherein they have erred. No doubt some revelations I have received have still been slightly misunderstood and I still seek for clarity and greater truth like the rest of us. I would also like to hear sforts beliefs that many would call “blasphemous”. At one point it was blasphemous to preach that the world was not flat, but now it is common knowledge. Thanks again.